Fall can be stressful for parents of children with seasonal allergies, but the right precautions can help reduce your child’s symptoms. Changing leaves and pumpkin-flavored treats are exciting signs of a new season for many, but if you’re the parent of a child with seasonal allergies, fall is far less welcome. If this applies to you, you’re not alone — between 5.5 million and 6.1 million children experience hay fever every year. Seasonal allergies usually develop between the ages of four and six, and they’re caused by the body’s reaction to outdoor allergens. The most common seasonal allergy is to spring pollen, but about 75% of people who are allergic to spring plants are also allergic to ragweed, a fall allergen. As a result, many children have a double-dose of seasonal allergies. In people with seasonal allergies, irritants like pollen and ragweed trigger the immune system to react to the otherwise-harmless substances as though they were attacking the body. This means the body can show symptoms that are nearly indiscernible from the common cold, including a runny nose, sneezing, and nasal stuffiness. Fortunately, there are a few ways to tell if your child is suffering from allergies or a cold. If allergies are the culprit, there are steps you can take to reduce your child’s discomfort. While cold symptoms and allergy symptoms are very similar, they do differ in a few key ways. Firstly, allergies occur around the same time every year. If you notice that your child always seems to get sick around the beginning of the fall, that’s a good hint that allergies may be the cause. Second, colds tend to go away in seven to 10 days, and the symptoms tend to change or intensify within that period. On the other hand, allergies will present the same symptoms day after day and can last for weeks at a time. If your child has itchy, red, or watery eyes, that’s another sign that he or she may have allergies. Itchy eyes only very rarely accompany a cold. Mucus can also help you identify whether your child has a cold or allergies. Both conditions can bring a runny nose and congestion, but if your child’s mucus is yellow, thick, and discolored, that indicates a cold. Clear and watery mucus, on the other hand, is a sign of allergies. If you’ve determined that allergies are the culprit, there are actionable steps you can take to reduce the impact of allergy symptoms. 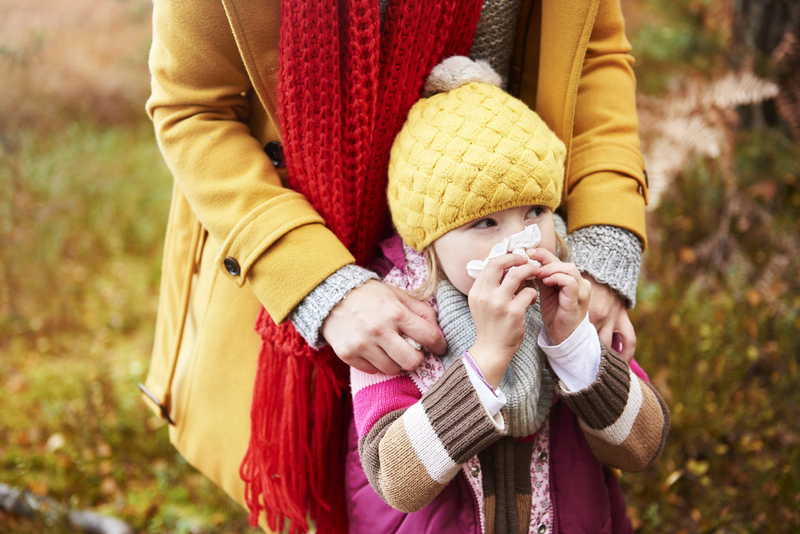 One of the best things you can do is reduce your child’s exposure to seasonal allergens. Sadly, this may mean cutting down on outdoor time or at least being strategic about when your child goes outdoors. Check local allergen counts before venturing outside, and keep in mind that warm, dry, and windy days can exacerbate symptoms. After any time spent outside, wash up and change clothes immediately to avoid tracking allergens into the home. You can also keep the windows closed when you’re inside the house, and run air conditioners in your home and car, to avoid environmental allergens indoors. It’s also a good idea to ask your child’s pediatrician about allergy medication. Many seasonal allergy sufferers find that the right medication can allow them to finally enjoy spring or fall, reducing or eliminating their symptoms altogether. Allergy medications include over-the-counter antihistamines, decongestants, and nasal sprays, as well as treatments like allergy shots. If your child is suffering from environmental allergies, the right pediatrician can help your family find solutions. Contact Kids’ Health today to schedule an appointment with one of our doctors.